My first attempt at making gluten free protein bars was somewhat of a failure since the protein per serving was too low. But, I’m happy to declare victory on my second try with these DIY Quest bars. Looking back, I have to admit that I spent way too much money on protein bars. The reason is because there are very few choices when it comes to all natural low carb protein bars. My favorite are Quest Nutrition bars and they are very expensive. And, not all of the Quest bar flavors are all natural either. The current flavors of low carb Quest bars that are all natural are Strawberry Cheesecake, Lemon Cream Pie, Coconut Cashew, Cinnamon Roll, and Chocolate Peanut Butter. The cost of these bars can really add up. So, I came up with a homemade Quest bar recipe that results in bars that cost less. Unfortunately, to get the nice chewy texture, you need one essential ingredient that probably isn’t available at your local store. The magical ingredient needed to make homemade Quest bars is VitaFiber Syrup which is a soluble dietary fiber, a prebiotic and a low-calorie sweetener. BioNeutra is the company that manufactures the syrup. I bought the large 5 kgs size of Syrup which came in a plastic bottle that looks exactly like a one gallon vinegar bottle. The sweetener used in VitaFiber Syrup is isomalto-oligosaccharide (IMO) which is a mixture of short-chain carbohydrates that are digestion-resistant. In addition to the syrup, a powdered form of this sweetener is available and I purchased a bag of that to experiment with as well. 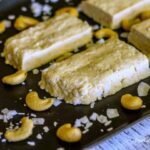 I tested out the homemade Quest bar recipe as a copycat of the Coconut Cashew flavor. 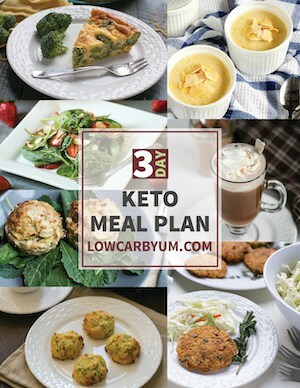 It was the first flavor I tried and it soon became one of my favorite low carb protein bars. To make my own version of this flavor, I used a nut chopper to finely chop a quarter cup of roasted and lightly salted cashews. I recently purchased this nut chopper and I absolutely love it because it makes chopping nuts so easy. Just turn the crank clockwise for coarsely chopped nuts and counterclockwise for finely chopped nuts. It can even be used upside down to chop nuts further without opening. 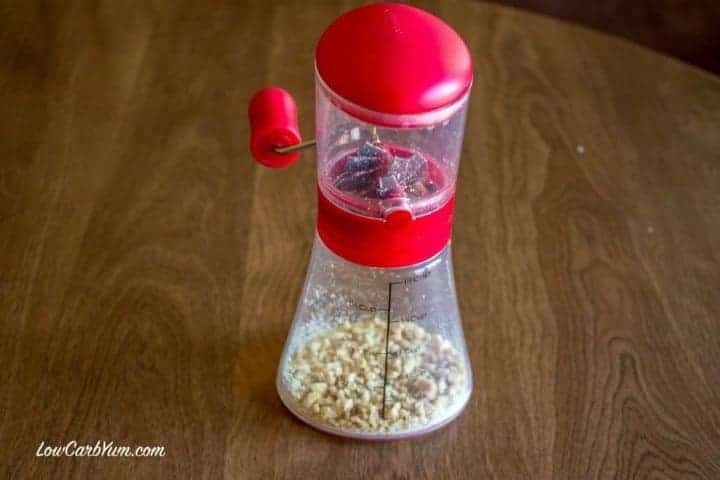 The best part is it doesn’t create any fine nut dust like a food processor or hand chopper. There are two basic ingredients to make the homemade Quest bar recipe. 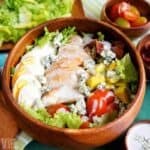 You’ll need protein powder and VitaFiber Syrup. I found that it is best to weigh the ingredients with a food scale because volume type measurements aren’t very accurate, especially when it comes to dry ingredients like protein powder. For each protein bar, you want to use about 35 grams of VitaFiber and 25 grams of protein powder. I used 23 grams of protein powder for each of these bars because that is the listed serving size on my bottle of natural whey protein which contains 18 grams of protein. The VitaFiber Syrup needs to be heated up so that it is easier to combine with the other ingredients. I used a wooden spatula to combine the ingredients together by hand. The syrup sweetener holds the dry ingredients together as well as creating a chewy texture unlike the dry crumbly bars made with powdered sweetener. 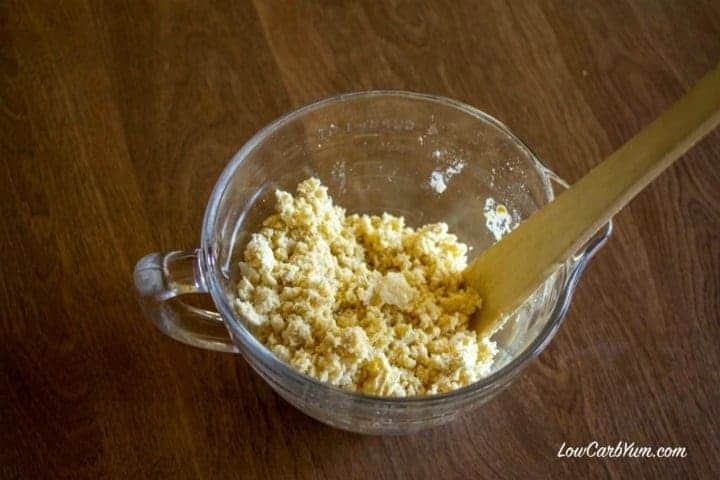 The mixture should be pressed out into a rectangle on a non-stick surface. I used a round silicone cake pan because it was a good size to stick in the refrigerator. You could use a silicone mat, parchment paper, or even plastic wrap. Putting the mixture in the refrigerator hardens the bars up so it is easier to cut them. The mixture will be slightly warm after mixing since the VitaFiber syrup was heated. Once cut, they should be wrapped up to stay fresh. There is no need to store them in the refrigerator unless you like your bars cold. None of the ingredients in these protein bars require refrigeration so it’s fine to store them at room temperature. 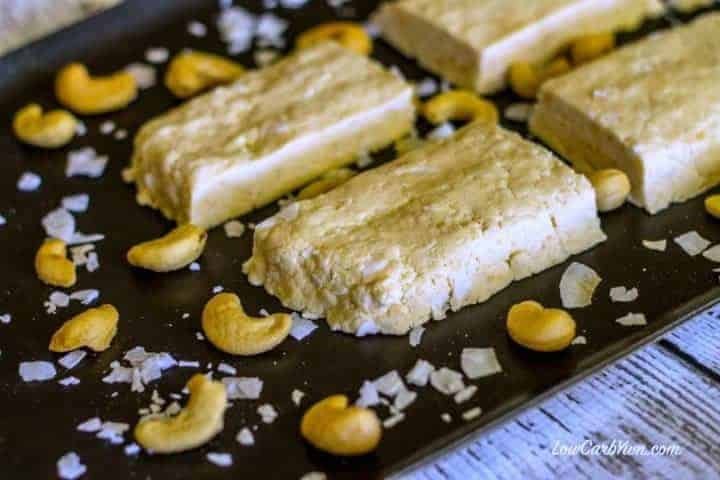 This homemade Quest bar recipe does not not produce bars that taste exactly like a Coconut Cashew Quest Bar, but it comes very close. The all natural Quest bars are also sweetened with erythritol, stevia, and lo han guo. I may add a bit of these additional sweeteners next time to see if the taste will more closely resemble that of a Quest bar. Combining sweeteners does have a synergistic effect which more closely resembles sugar. However, the main sweetener for Quest bars is isomalto-oligosaccharides (IMO) which is the VitaFiber sweetener. I will be experimenting more with VitaFiber and trying to come up with different flavors of homemade Quest bars. 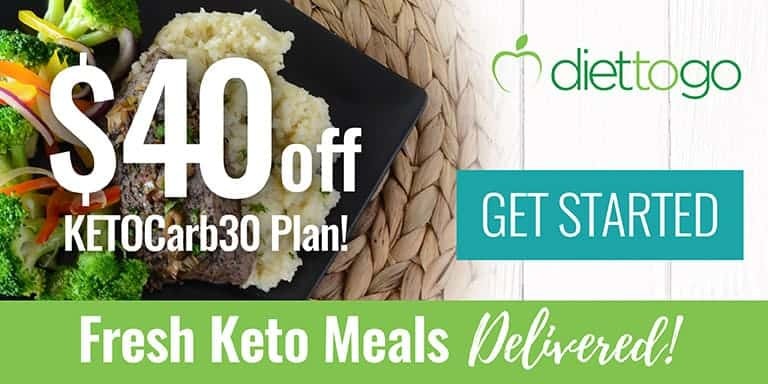 This is going to save me tons of money by making my own delicious all natural low carb protein bars at home. 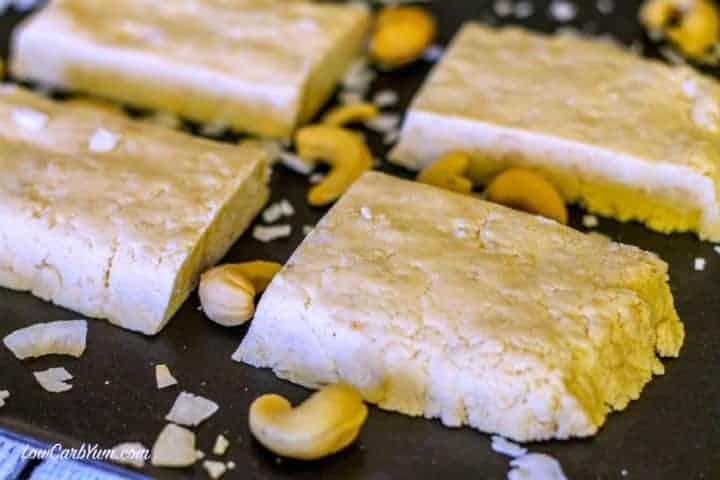 These low carb coconut cashew protein bars are extremely filling. In fact, I was full after eating only a half a bar. 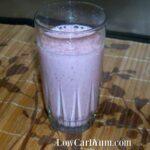 They would make a great meal replacement for those who are cutting calories to lose weight. 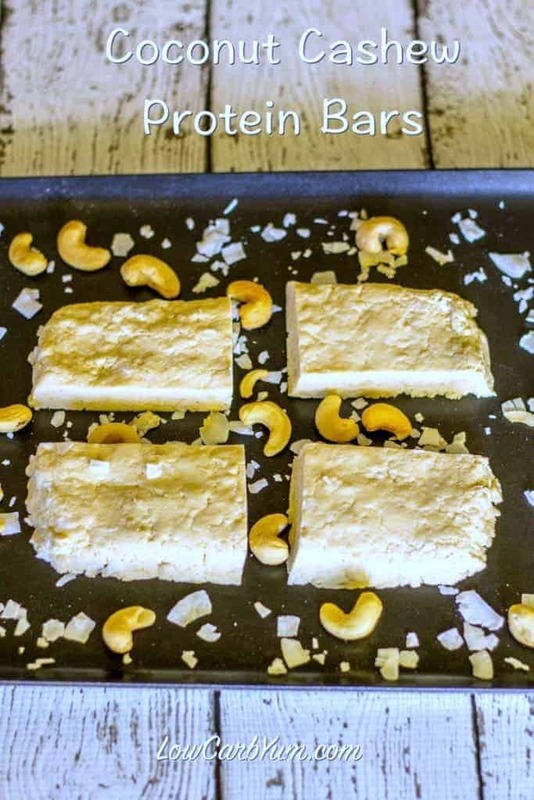 Save money by making your own homemade coconut cashew Quest bar with this quick and easy recipe. 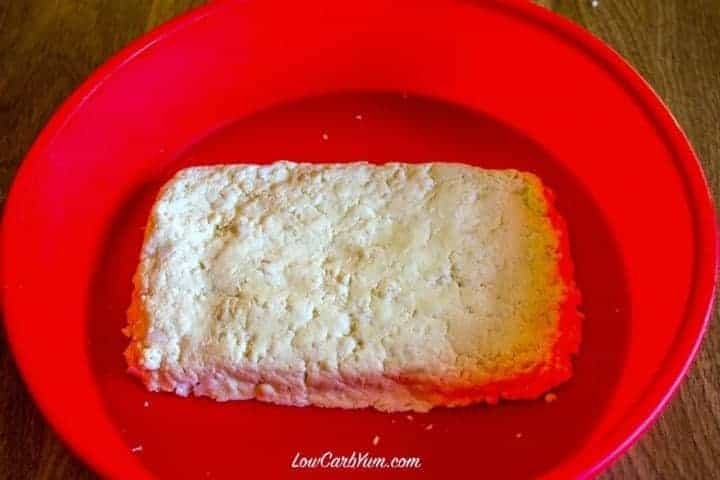 These low carb all natural protein bars are simple to make. Heat VitaFiber syrup just until bubbles begin to form (about 30-40 seconds in microwave). 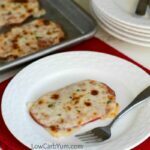 Form mixture into a rectangular shape on non-stick surface. Cool in refrigerator about 1-2 hours. Cut into four equal size bars and individually wrap. Adjustments may be needed to the amount of protein powder and syrup used to get the appropriate consistency. 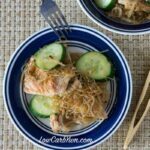 To lower net carbs, use only 1/2 or 1/3 coconut and cashews. Carbs can be reduced even further by leaving out coconut and cashews and flavoring with any extract like lemon or orange. 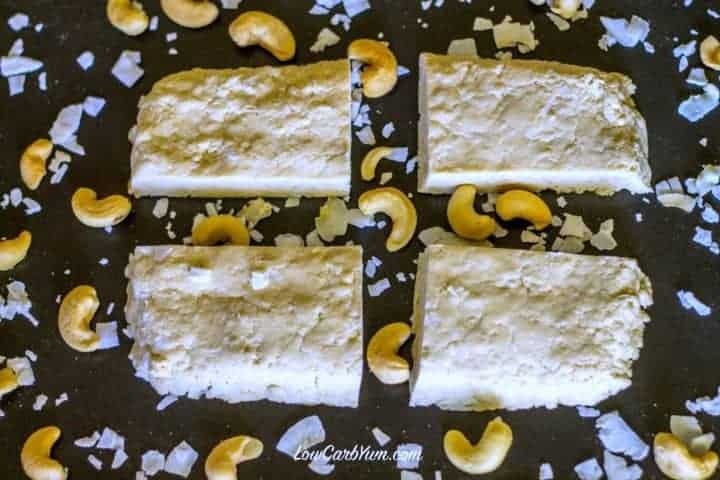 [post_content] => Save money by making your own homemade coconut cashew Quest bar with this quick and easy recipe. 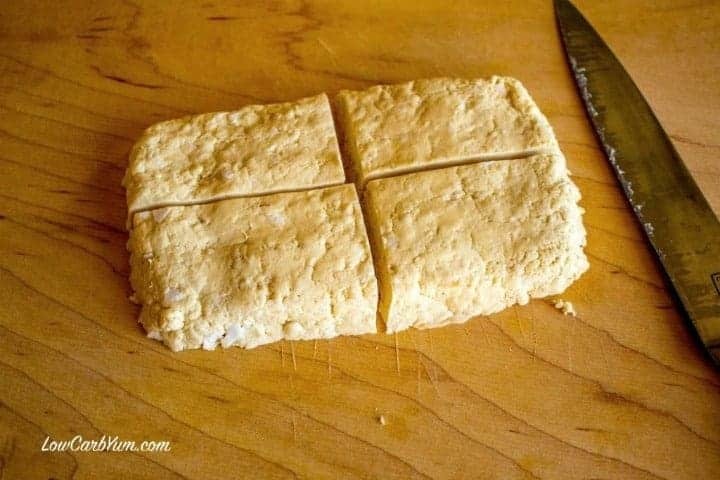 These low carb all natural protein bars are simple to make.